What is the difference between the worker and the artist under capitalism? Historically, the two can be distinguished by object of their labor: the artist works for the sake of work itself, a disinterested labor whose autonomy gives rise to creativity and self-expression, whereas the worker, compelled by the necessity, works for a wage whose function is merely to sustain and thus reproduce the worker’s life. While freedom from the market stimulates and invigorates the mind of the artist, the market’s relation to the worker, writes Marx, “destroy[s] the actual content of his labour by turning it into a torment. . . alienat[ing] from him the intellectual potentialities of the labour process” (799) But what if this distinction between wage-worker and artist collapsed, and the object of labor for both became indistinguishable? Sarah Brouillette in Literature and the Creative Economy argues that collapsing the two produces the worker of the creative economy. Brouillette describes the creative economy as set of beliefs and practices in which in the figure of the artist is used as a model in the interests of capitalism for converting older forms of routinized and mechanized labor into new forms of post-fordist labor that appear creative and autonomous, yet less-secure and more easily exploitable. Brouillette’s aim in studying the creative economy is not to debate whether it exists, but rather, as she puts it, “to focus attention on how and why faith in its existence has become consequential” (2). Her project tracks creative economy ideology as it manifests in the policies of Britain’s Labour party during the 1990s, postwar Maslovian psychology and its relation to business management theory, recent trends in urban development and gentrification, and the literary market of contemporary British fiction. While Literature and the Creative Economy offers close readings of five novels and book of poetry, it also scrutinizes the institutional discourse of government and business in which creative economy ideology is realized. Through this approach, Brouillette provides readers not only with an institutional history of the creative economy, but also an explanation of art’s integral role in its formation, challenging the assumption that art inherently critiques or offers alternatives to capitalism. This is argument complements the work of Luc Boltanski and Éve Chiapello who demonstrate in The New Spirit of Capitalism (2005) that the “artistic critique” of capitalism, best expressed in the hippie cultures of the 1960s, precipitated new forms of capitalist production in which the demand for greater worker-autonomy “is exchanged against security, to the point where it is often a forced, involuntary autonomy, difficult to equate with freedom” (430). Like Boltanski and Chiapello, Brouillette’s aim is to call attention to the ways in which the desire to be autonomous from capital is often used to support rather than oppose its expansion. Brouillette locates the inception of creative economy ideology in the work of celebrity academic Richard Florida and his book The Rise of the Creative Class (2002), as well as in the policies of Britain’s Labour Party during the 1990s. Working as a high-paid consultant, Florida propagates the creative-labor model not only because, as he believes, it leads to greater happiness and pleasure, but because in doing so it increases worker productivity and efficiency, leading to greater profits for corporations who take up this model of employee management. Similarly, Britain’s Labour Party considered the investment in creativity a condition for Britain’s success in the global economy. Labour Party leaders surmised that increased access to art and culture would generate among British workers creative experiences in which they could gain the skills necessary for new forms of affective and communicatory labor of the world’s emergent immaterial economy. Furthermore, these creative experiences would teach workers that cultural equality is more important than economic equality, and that collective organizing leads to losses in freedom and autonomy. Brouillette thus considers the creative economy a neoliberal ideology that weakens collective labor, legitimizes economic inequality, and masks the antagonism between labor and capital. By modeling forms of labor on the life of the artist, the creative economy also demonstrates a neoliberal belief in the concept of human capital in which the worker’s life and the skills and abilities produced therein are regarded one’s personal capital. This belief is best expressed in Brouillette’s chapter on famed psychologist Abraham Maslow and the later business management theories that his work inspired. Maslow thought that work modeled on the artist provided opportunities for self-improvement and self-actualization, a kind of self-enhancement that would not only heal the psychosis of modern man, but also augment the worker’s capacity for innovation. In Foucault’s work on neoliberalism, he points out that neoliberal economists like Gary Becker considered work-place innovation the greatest solution for resolving capitalism’s problems. They also assumed that this innovation stemmed directly from “investments made at the level of man himself” (Foucault 231). Creative-economy proponents thus invest in creativity and the innovation that it produces by presenting work as a process in which the worker’s life can be formed into a life of the artist–a life whose value is measured by the innovation it provides to business. Creative-work consists less in selling one’s time to capital than it does in enhancing one’s life for capital. In the creative economy, life no longer “begins . . . at the table, in the public house, in bed,” as Marx believed, but rather becomes a form of labor itself in which striving to live a creative life like that of the artist is the content and object one’s work (25). Still, the question Literature and the Creative Economy raises is if art can be used to challenge rather than legitimize capitalist power? In other words, is there a way out of this loop of capitalist appropriation? For Brouillette, the answer lies in abandoning the belief that creativity is a natural condition of human existence. Instead, we should understand it as a historically contingent concept that emerges as a product of rather than a point of resistance to capitalist modernity. In perhaps the most ambitious section of the book, chapter 2 “Work as Art/ Life as Art,” Brouillette argues that the critiques of immaterial labor offered by Italian autonomists Paolo Virno, Maurizio Lazzarato, Michael Hardt and Antonio Negri implicitly contain this ahistorical understanding of human creativity. Comparing the autonomists to Richard Florida, Brouillette asserts that while the autonomists may oppose capital’s commodification of social and aesthetic life outside of the factory or office, a feature of creative-labor that Florida celebrates, they, like Florida, still “imagine creativity as located within individuals’ unconscious experimental energies and self-expressive capacities” (35). For the autonomists to believe in a universal creative-self found in the “mass intellect” of the “multitude” belies the relationship this image might share with the interests of capital. Thus, to historicize human creativity is to confront the ways in which this concept serves to uphold rather than subvert capitalist reality. If Brouillette shows us how art and the life of the artist are used to support neoliberal capitalism, this is complemented by an examination of how contemporary artists themselves make sense of this relationship. In her chapters on contemporary British fiction, Brouillette explores the question of how literary artists come to terms with their own position as creative-workers, as well as how their fiction reflects, produces, or even perhaps critiques creative-economy ideology? Brouillette begins with Aravind Adiga’s The White Tiger (2008) and Monica Ali’s In the Kitchen (2009), two novels that not only represent the psychological pain of the creative-worker’s pursuit of neoliberal entrepreneurialism, but also reflect over their authors’ relationship to the kinds of creative-labor these novels attempt to critique. Brouillette argues that Adiga and Ali, like their protagonists, display an ambivalence toward their participation in a creative economy built upon the exploitation of cheap labor performed by the world’s material economy. Brouillette points out a similar problem in Daljit Nagra’s book of poetry Look We have Coming to Dover! (2007) and Gautam Malkani’s novel Londonstani (2006). These authors promise to represent the often overlooked ethnic or marginalized communities of Britain’s population, but confront a market in which these stories are only consumed for their cultural diversity and/or experiences of “real-world” authenticity. The problem, then, is that these communities must live in conditions of poverty and violence in order for their lives to appear diverse or authentic in the first place. If literature’s once subversive feature was its autonomy from the market, it is clear today that autonomy is literature’s most marketable feature. However, Brouillette suggests that for literature to be once again critical of the world it represents it will have to enact a self-conscious form that foregrounds the limits of its autonomy. Two novels that Brouillette believes exemplify this form are: Ian McEwan’s Saturday (2005) and Kazuo Ishiguro’s Never Let Me Go (2005). McEwan and Ishiguro are writers who “tend now not just to position themselves as critics but [who] use their work to explore the barriers to effective critique” (17). These novels represent instances in which literature not only fails to critique capitalist reality, but also explicitly supports and produces it. Saturday reveals how literature is used to avoid political commitment, and soothe class antagonism, while Never Let Me Go shows how “social and political values conventionally ascribed to art’s critical capacities have been and can be challenged and undermined” (205). Both novels highlight rather than suppress the problem of the artistic autonomy, and in so doing, offer a way forward rather than a way back into the loop of the creative economy. 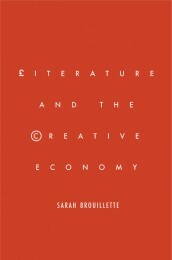 Literature and the Creative Economy provides us, then, with an important contribution to the study of art’s relation to capital, earning its place in a long line of thought from Theodore Adorno, to Pierre Bourdieu, Fredric Jameson, and Terry Eagleton (among others), who have made the question of art’s relation to capital a central focus of their scholarly work. If for these scholars the question of art is how it can be autonomous, for Brouillette the question is how art might be self-critical of the limits and potentials of its assumed autonomy. “Pressing for me,” writes Brouillette, “is the way in which the arts reflect upon the possibilities of their own autonomous status. Art becomes a space where the struggle between autonomy and the market takes place—a space in which the possibility of establishing some sort of autonomous relation to capital is imagined and negotiated and in which the limits of the market are made plain” (207). According to Brouillette, it’s not a question of whether art can be once again autonomous; rather, it’s a question of whether artists can make the problem of autonomy itself the object of representation. While Brouillette usefully clarifies the problems and potential for the artist and literary production today, her account remains located within, and arguably limited to the specific context of the immaterial economy of the global north. In other words, Brouillette’s study of the creative economy is largely a study of the world’s consumer society whose problem, she points out, is the emergence of a new ideology of creative-work that helps exploit more efficiently the labor of its workers. Yet, no study of the global north’s immaterial economy is complete unless also approached through a study of its relationship to the material economy of the global south that structurally determines it in the first place. This is a relationship in which, as Richard Godden remarks, “the periphery bled tribute to the center and poor nations effectively subsidized rich ones by way of the cheapened, robbed, and abused bodies of their laboring populations. . . [material] labor, however peripheral to thought and geography, however seemingly disposable, retains its place at value’s core” (421). While at times Brouillette acknowledges this correlation, particularly in her discussion of the novels of Adiga and Ali, her focus remains on whether artists of the global north can make sense of, or even critique, an immaterial economy that has found new ways to exploit their creative capacities. Perhaps, a further question to ask, one that complements rather than counters Brouillette’s concern over how art represents its role in the formation of a creative economy, would be if art has the capacity to represent the structural relations of global capitalism in which the labor of the global north is dialectically linked to the labor of the global south. Foucault, Michel. The Birth of Biopolitics: Lectures at the Collège De France, 1978-79. Trans. Michel Senellart. New York: Palgrave Macmillan, 2008. Print. Godden, Richard. “Labor, Language, and Finance Capital.” PMLA 126.2 (2011): 412-441. Print. Marx, Karl. Capital: A Critique of Political Economy. Trans. Ben Fowkes. New York: Vintage Books, 1977. Print. — . “Wage Labour and Capital.” The Marx-Engels Reader. Ed. Robert C. Tucker. New York: Norton, 1978. Print. Walter Oliver Baker is a PhD student in American Literary Studies at the University of New Mexico where he studies the relation of literary form and aesthetics to modes of economy from the late nineteenth century to the contemporary. His dissertation project compares the literary forms of American literature that represent capital’s periphery–the site of primitive accumulation and proleteriatization–to the literary forms representing capital’s industrial and financial centers.